In this article, the energy band structure of GaAs is explained with a diagram and also with respect to its comparison with Silicon. The cause of the curves in the valence band and conduction band of GaAs is thoroughly explained. Electron Mobility, a characteristic of GaAs, and its depending characteristics are also explained in detail. The light emitting diode characteristics of GaAs is also compared with Silicon. And is also inversely related to the electron effective mass, m.
For GaAs, the effective mass of these electrons is 0.067 times the mass of free electron (that is, 0.067me, where me is the free electron rest mass). Thus the shapes in the conduction band bring about a superior electron mobility. Due to this, the electrons travel faster in Gallium Arsenide (GaAs) than in Silicon. However the conduction of electrons of GaAs is very similar to that of Silicon in the higher valleys. The reason behind this is the high mass and strong inter-valley scattering which provide very low mobility. Furthermore, Gallium Arsenide is a direct-gap semiconductor. Its conduction band minimum occurs at the same wave vector as the valence band maximum , which means little momentum change is necessary for the transition of an electron from the conduction band, to the valence band. Since the probability of photon emission with energy nearly equal to the band gap is somewhat high, GaAs makes an excellent light-emitting diode. 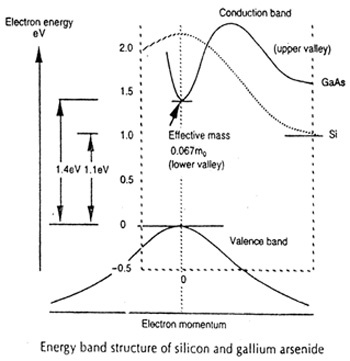 Silicon on the other hand, is an indirect-gap semiconductor since the minimum associated with its conduction band is separated in momentum from the valence band minimum. Therefore it cannot be a light-emitting device.